Mattel's Masters of the Universe series continues to pump out the releases, and there's a new batch that have made it over the seven seas safely to my shelves. 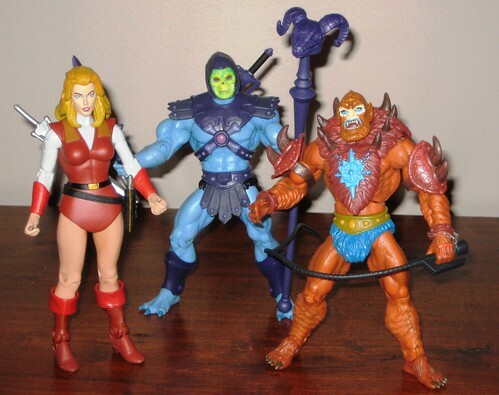 All in a short space of time, I received Adora, Beast Man and Skeletor. Not close enough though: with Adora on subscription, Beast Man up for re-release on the same time and Skeletor a few days later, I paid three lots of shipping for these - frown! 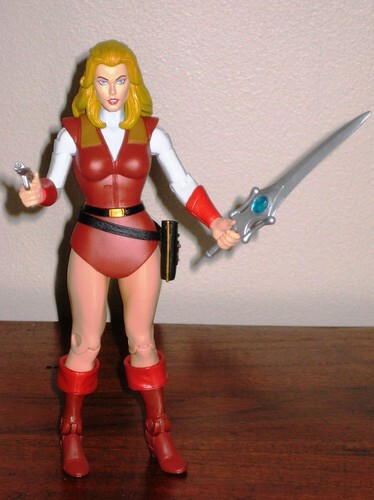 I don't have the same nostalgia for the Princess of Power characters as I do for He-Man and friends, but Adora fits in He-Man's world, so I'm very happy to have her. She looks great - very clean paintwork and nice colours. The only concern I have here is how she compares scale wise to the male figures. She's taller due to the guys' bunched up pose, but she also seems a little bit bigger all over, so just looks a touch out of place. I've heard lots of great things about Beast Man, but nothing prepared me for how great this figure is in person. Great colours, great scowling face, and fabulous, fabulous costume pieces. The whip is great fun and creates lots of possibilities for posing. I can see that this figure is very quickly going to become one of my favourites in this series. With Skeletor finally in my posession, I feel like a real Masters of the Universe collector now. I've never seen the first release, so I have nothing to compare it to, but I was surprised by the amount of green under the yellow on Skeletor's face. That's my only query here, sculpt and the rest of the paintwork are great, and the fun range of accessories are much appreciated. Very happy to be able to stage the requisite He-Man and Skeletor battles! 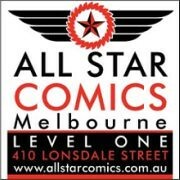 All up, more Masters of the Universe fun, and I'm keen and ready for more! I just received my Battle Cat, so the MOTUC diorama is about to expand greatly - pics and review soon! You can see more pics at Facebook, discuss this at the AFB Forum, and comment on this post to enter the March AFB Comment of the Month Contest. ** Remember - it's Orange Month at AFB, and in celebration one commenter AND one AFB Facebook fan will receive a prize. That Beastman does look sensational, and that handle on the whip reminds me of the vintage ones. It's the little details like that with respect to nostalgia that makes me want to jump in, despite the monetary and space restrictions. Oh, and pretty sure Skeletor always had a decent mix of green and yellow. Think of it this way: imagine her an Amazon, like WW, that's why she's taller. Her clothes remind me of how Jack Kirby's style of drawing heroines. oh I loooved She-Ra as a kid. had a few figures too, and a bright pink castle (!) but now sadly they've all been got rid of. I think Adora looks great. Not sure you can think of her as an Amazon until she's transformed into She-Ra though. yeah, I have no real problem remembering these guys as a kid. The only figure I could see myself getting from this toy line is Skeletor and since he will be coming down the line in a two pack with Lex Luthor that is probably when I would bite. Great score for some great looking figures Andy! I'd love to go down the MOTU collecting path, but honestly, the pain isn't worth it. Outside of the paint job on the face, the orig skeletor also had the large open left hand like scareglow. Plus matty choose to change the face paint mid way through production so there's like 2 or 3 variants. Always liked grizzlor more than beastman, though he does look good I will admit. Adora is a solid release, though I am of the mind that on machoriffic eternia the women should be smaller than the men most of the time. Still the height isn't too different to upset me. I don't know why I've never cared for Beast Man, but I don't.